1. Equilibrium. The carbonate system. Alkalinity. pH scales. Partial pressure and fugacity. The Revelle factor. Worked out problems. 2. Kinetics. Basic concepts of kinetics. Temperature dependence of rate constants. Reactions and rate constants of the carbonate system. Approaching equilibrium: the carbonate system. Approaching isotopic equilibrium: 12C, 13C, and 14C. Diffusion and reaction. Summary. 3. Stable Isotope Fractionation. Notation, abundances, standards. Carbon. Oxygen. Boron. Thermodynamic properties of isotopic substances. A. Equilibrium constants. B. From two to six. C. Details and Calculations. D. Answers to Exercises. E. Notation and Symbols. References. Index. Carbon dioxide is the most important greenhouse gas after water vapor in the atmosphere of the earth. More than 98% of the carbon of the atmosphere-ocean system is stored in the oceans as dissolved inorganic carbon. The key for understanding critical processes of the marine carbon cycle is a sound knowledge of the seawater carbonate chemistry, including equilibrium and nonequilibrium properties as well as stable isotope fractionation. Presenting the first coherent text describing equilibrium and nonequilibrium properties and stable isotope fractionation among the elements of the carbonate system. This volume presents an overview and a synthesis of these subjects which should be useful for graduate students and researchers in various fields such as biogeochemistry, chemical oceanography, paleoceanography, marine biology, marine chemistry, marine geology, and others. The volume includes an introduction to the equilibrium properties of the carbonate system in which basic concepts such as equilibrium constants, alkalinity, pH scales, and buffering are discussed. It also deals with the nonequilibrium properties of the seawater carbonate chemistry. Whereas principle of chemical kinetics are recapitulated, reaction rates and relaxation times of the carbonate system are considered in details. 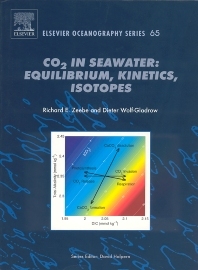 The book also provides a general introduction to stable isotope fractionation and describes the partitioning of carbon, oxygen, and boron isotopes between the species of the carbonate system. The appendix contains formulas for the equilibrium constants of the carbonate system, mathematical expressions to calculate carbonate system parameters, answers to exercises and more.